I purchased this oak tissue box cover late last year at the thrift shop for a couple of bucks. I had given it a couple of coats of Annie Sloan Chalk Paint in "Old White" months ago, but wasn't quite sure how to decorate it. I pulled it out today to try out a new distressing method for chalk paint that I had spotted recently on Pinterest. 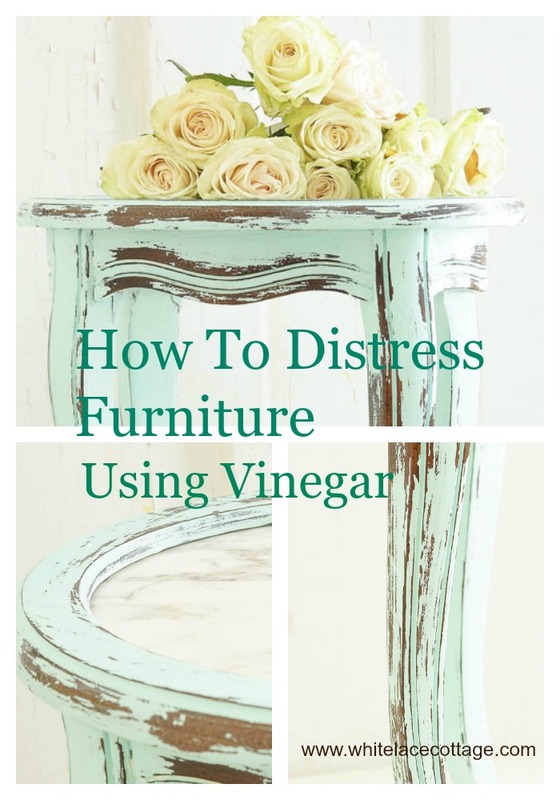 Anne from White Lace Cottage had shared her no-sanding method of distressing furniture with water and vinegar. I love how easily chalk paint distresses with sand paper but what a dusty mess unless you wax first, and then re-wax. I filled my spray bottle with half water and half white vinegar and sprayed the first side of the tissue box cover. First, I tried rubbing with a rag (like Anne suggests), and then I tried a pot scrubber pad. It took a while for me to get the hang of it. The rag worked slower than I wanted, but the scrubber took the paint off a little too fast unless you were careful. I repainted the first side once, and I ended up using both the scrubber and the rag until I got the desired effect. This method also smoothed out the brush strokes, and left a nice texture. After I had distressed the piece to my liking, I brushed on some ASCP clear wax. I painted an old brass drawer pull in "Old White" too. If the drawer pull adornment looks familiar, I used a large painted pull on my re-purposed drawer plant stand HERE. Did you notice anything new about my blog today? After over three years of blogging, I gave my blog a much needed face-lift. Actually, I hired Kim Six of KIM SIX FIX to update my very basic blogger template with a few more bells and whistles, and a more professional appearance. Kim was great to work with, and I highly recommend her services! 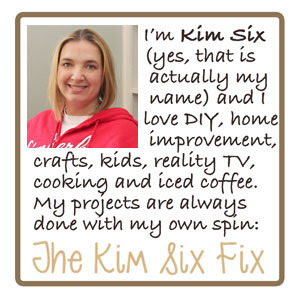 Even if you don't need a blog makeover, go and check out Kim's blog. She has a slew of clever DIY ideas that I know you would love. Your recycle tissue box looks great and so does your new blog! Great look. Love your header. Love the makeover for your tissue box cover. Fun re-do project and the the blog re-do is great, too! The tissue box is so pretty and I love the new look. I think updating our blog once in awhile gives us an uplift ourselves! Love how the tissue box turned out. Great look to your blog, too! Carlene, I love love the makeover. Now I need to find one. I always pass those by but now that I want one I probably can't find one. LOL! This turned out wonderful. Love the new look of your blog. It looked great before but it is always nice to have a makeover. Adorable! You are amazing! I've been looking for things to redo at the Thrift - but, no wood things yet! I will have to try the vinegar method! Thanks for sharing!